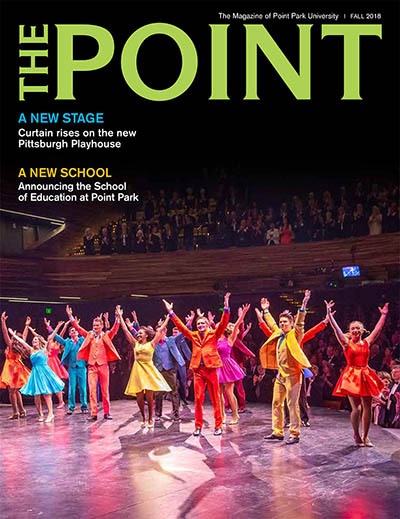 The Fall 2018 issue of The Point, the magazine of Point Park University, is now available on campus and online. Center Stage: Curtain rises on the new Pittsburgh Playhouse in Downtown Pittsburgh. School in Session: Point Park establishes a new School of Education to meet current needs in education for undergraduate, graduate and doctoral degrees. Gala Opening: Playhouse opens with a black-tie gala featuring Academy and Tony Award-winning alumni and dazzling entertainment. Also read about: Baseball Pioneers, the baseball teams of the 1970s who remain wildly dedicated to the game and to each other; the new Point Perk coffeehouse and new offices for The Globe and WPPJ; and student-athlete mentor John Ashaolu, Point Park’s new director of athletics.